(Nanowerk News) Researchers working at the National Institute of Standards and Technology (NIST), the University of Maryland, and Sandia National Laboratories, have for the first time imaged the inner workings of experimental solid-state batteries as they charged and discharged while making detailed measurements of their electrochemical health. Their work has helped explain why the batteries rapidly lose performance and suggests a way for improving them. 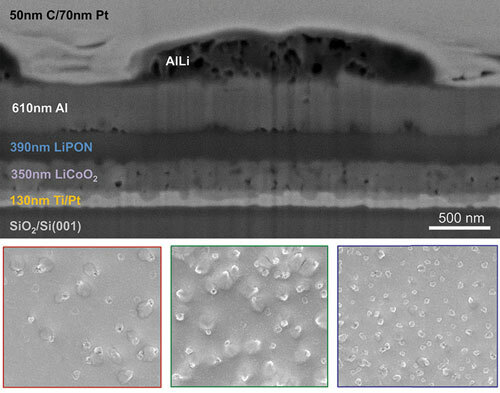 The results appear in the Journal of Materials Chemistry A ("Insights into capacity loss mechanisms of all-solid-state Li-ion batteries with Al anodes"). While most batteries on the market today have liquid electrolytes, solid-state batteries have, as the name implies, a solid one. Not needing a liquid makes these batteries amenable to high throughput manufacturing techniques and opens the door to making them smaller, thinner and even flexible. In fact, the entire battery assembly can be little more than a few micrometers thick. In commercially available lithium-ion batteries used in cell phones, for example, the anode (the side of the battery where electrons flow out to a circuit) is usually made of carbon. But in these new solid-state batteries, scientists have been experimenting with other materials, including aluminum because it’s so light, an important consideration for mobile devices. Researchers know that these batteries’ performance degrades rapidly after a small number of charge and discharge cycles. In fact, they lose 90 percent of their capacity after 10 cycles. What no one knew was why. According to University of Maryland researcher Marina Leite, most of the work on imaging large areas of solid-state batteries has only shown snapshots of the device before and after charging it. The imaging technique can be used with any solid state battery. It combines a number of different tools including photoelectron spectroscopy, scanning electron microscopy and Auger electron microscopy (it analyzes electrons emitted by excited atoms to determine the elemental composition of a surface) under high vacuum. The setup enables the team to precisely control the lithium reaction rate, the battery state-of-charge and state-of-discharge, record the electrochemical potential, and to correlate these parameters with specific changes in the electrode’s structure and chemical composition. Their experiments revealed that the batteries’ performance degrades due to oxidation of the surface of the aluminum anode. The aluminum oxide, which appear as cottage cheese-like lumps, captures lithium ions and prevents them from returning to the cathode during recharging. Fewer lithium ions in the cathode means the returning electrons have fewer places to return to, progressively reducing the batteries’ energy capacity. “The formation of an alloy at the surface of the anode strongly suggests that in order to successfully use aluminum as an electrode its surface needs to be protected by adding a different material that will not alloy,” says NIST researcher Andrei Kolmakov. Leite further notes that new research will focus on the anode’s surface-driven reactions and the critical role they play in the ultimate performance of these types of batteries, instead of the electrolyte/anode interface as is common with other battery architectures.